Probably has the top boss fights in any game. Each level's music is memorable and unique. Each level has something that will wow you. 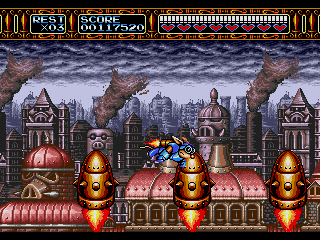 Rocket Knight remake on Steam. Youtube review of Rocket Knight Adventures. A diamond (yes I said diamond) for the Genesis that every gamer needs to play at least once. Ah man, Rocket Knight Adventures where do I begin... Well let's just say if you haven't played this game it'll make you realize why you love games to begin with. 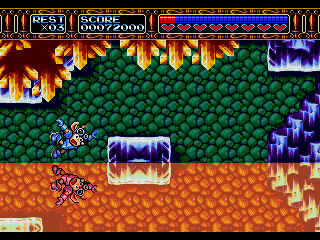 Rocket Knight Adventures was the forerunner to the better known Sparkster for the Genesis and SNES. 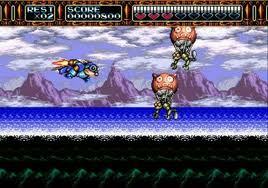 Made in 1993, Rocket Knight Adventures was a game that many consider to combine many elements from other popular gaming icons such as Sonic, Mega Man and other side scrolling games. I myself consider this a very marginal statement since many of the things in this game I had never seen before when it was released. The story begins about an opposum named Sparkster from a group of elite soldiers known as the Rocket Knights who finds the princess of a land known as Zebulos being kidnapped by a rogue Rocket Knight named Axle Gear. 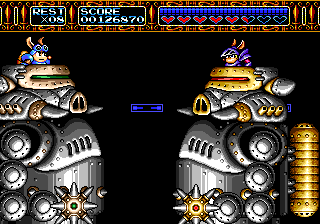 Even though the emperor of the Pig Star army is the mastermind, Axle Gear is the one you'll find yourself up against a lot of the time, it almost seems kind of like the relationship between Mega Man and Proto Man in Mega Man 3 (did I just connect Mega Man to rocket knight, ouch). Getting to the gameplay, each level is always different: you go through mines, lava levels, in the air and even in space. You'll be avoiding obstacles on a mine cart, hanging by your tail over spikes and even boxing with giant robots; that's right there's giant boxing robots in this game. Can you just buy or borrow or do whatever you have to do to get this game and play it now please? Graphics: The graphics in this game still look great in 2010 and even though Sparkster may have nicer graphics, this game's style is original to itself and there are so many little details in this game that make it amazing; such as seeing your reflection in a certain level that you actually must watch to progress through it! Sound: Each level has just an amazing amount of ingenuity in each of their themes it reminds me of the first Streets of Rage where I can't even name my favorite level theme. Most of the times you'll find yourself either pumped by the music or finding that it's making you even more nervous while trying to avoid being killed. Gameplay: So many gameplay elements to talk about here. You can charge up your rocket jet pack to reach hidden places and even bounce off multiple walls if you time it right. You can swim underwater, or hang by your tail, whether it be off the ground or thousands of feet in the air. You get to ride and operate robots and escape death that is always just a half a second behind you. This game changes so much and keeps it fresh and a lot of the time you better be on your toes or you're dead. Replay: As for this, there's three difficulties and about the only replay value is in beating each of these. Honestly, I don't think unless you're a messiah of gaming you'll beat hard your first time playing this game, or even normal; easy is where you'll want to start and from there you'll learn how to beat it at its toughest. 3 continues with easy, 1 with normal and zilch with hard. However contradicting my statements, I've played this game so many times within a week just to go back and find myself discovering new things in the environment that catch my eye and appreciate this gem. Learning Curve: This part is definitely important, there will be times when you will die multiple times with several lives just to get past a certain part and bosses you can't just slash at, have to pay attention to what they are doing and figure out when is the right time to strike. It will take multiple lives and playthroughs on the lesser difficulty to jump up to the next difficulty level. This game is for those who like to be challenged and are looking for a platformer/game that is a one of a kind experience and always keeps itself fresh.